I have spoken at The Business Start-Up Show and Business 2012 and was invited as the keynote speaker to several seminars, exhibitions and networking groups. I was also invited to speak at various BT workshops and was honoured to be a speaker at The London Book Fair and The Cape Town Book Fair. As an author, I was regularly invited to combine a book signing session with public speaking and delights delegates over a business lunch or engages with them at an after dinner event. I get a huge buzz when talking to networking groups and running workshops and seminars on Online Marketing, SEO, PR and starting up a business ... and I've been a regular contributor to many business magazines and newspapers. You can see more about me in the news here. These quotes are from the various places that I have been a public speaker. 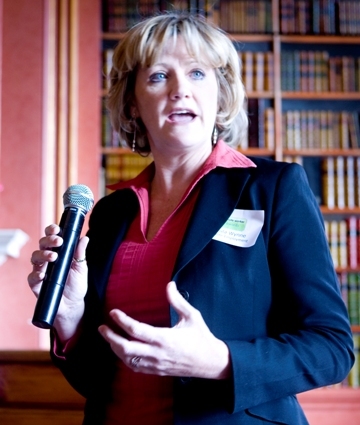 In Need of an Inspirational, Engaging and Passionate Speaker? Paula is a popular motivational public speaker renowned for her passion, energy, enthusiasm and humour. Within a session of just 30 minutes Paula shares many valuable tips and insights with her audience. Imagine what power she can punch into a 60 minute or more session! Her personal approach of chatting to her guests with little anecdotes and real examples reinforces her constant flow of tips and advice. "Thanks Paula, your talk was excellent! I thoroughly enjoyed your great sense of humour! As an entrepreneur with a new business, I found your tips very, very helpful." Adejoke Abudu. "In today’s fast-and-furious cyber age the world is getting smaller as the internet weaves an invisible social and business web around us. Everyone is online and needs an online presence, from writers, actors and hobbyists to start-ups and small business owners." "Paula’s audiences enjoy how she spends time looking at the nuts and bolts of creating a website and then demystifies the dry, crusty subjects of search marketing, search engine optimisation." "Paula's workshops, seminars and speeches are extremely popular because she breaks down the subject matter and makes it easy to understand. Paula’s DIY aPaula Wynne, inspirational and passionate business speakerpproach leaves the audience highly inspired and wanting more. Many have said they can listen to her for hours! Steeped with practical information and useful content, which is entertaining, enlightening and very informative, Paula’s teaching style delivers hands-on interaction to give the listener confidence and her speeches are down to earth and engaging and extremely motivational. As a small home business starting out as the recession hit the UK, Paula experienced the financial constraints that every small business startup, entrepreneur, and independent business working on a shoestring has to juggle." I have also been in Sainsbury’s Magazine, Entrepreneur Country, Tatler, Flybe, PC Utilities, Readers Digest, The Sun, South African Times, Berkshire Life, Woman and Home, U Talk Marketing, Woman's Own, Lighter Life, Reading Evening Post, Newbury News, Oxford Times and The Daily Mirror. I have contributed to various publications and magazines and recently penned articles for Writers News, Writing Magazine, Cakes and Sugarcraft, Craftseller, Making Jewellery, iVillage, Financial Mail Women's Forum, iProgrammer and Babyworld.